The hesed continues to operate its day center for Jewish elderly, said Mr. Pleskachevsky, accommodating 30 clients every day. Participants are assigned to one of 24 different groups, usually based on area of residence in order to simplify van transportation, and each group comes to the hesed twice monthly. While at the hesed, clients participate in various socializing activities and, if desired, arts and crafts. Some very basic medical care is available, and arrangements are made for more comprehensive medical services inphysician offices and medical clinics. Other Jewish elderly participate in a variety of clubs, a choir, exercise classes, and other activities for seniors. In all, Mr. Pleskachevsky stated, more than 200 clients are in the hesed every day. Not all of these clients are elderly, explained Mr. Pleskachevsky. Eighty younger people (ages 18-45) with various disabilities also are brought to the hesed three days each week for recreation, socializing, and psychological assistance. Each of these clients is assigned to a group based on the nature of their disabilities. In addition to services within the hesed building, JDC also operates a hesed-on- wheels, a van that serves needy (mostly elderly) Jews who live in remote areas. The hesed-on-wheels visits a different town or village every weekday, Mr. Pleskachevsky stated, calling on each at least once monthly and some twice each month. A hesed worker schedules client visits and may bring medications or other items required by the client. 38. Adopt-A-Bubbe/Adopt-A-Zayde is an independent assistance program created by Dr. Judith Patkin, the Executive Director of Action for Post-Soviet Jewry in Waltham, MA. The Dnipropetrovsk organization supports elderly Jews in Dnipropetrovsk itself and in 18 additional cities or large towns and numerous smaller towns in eastern, central, and southern Ukraine. However, the total number of towns served has declined as Jewish populations in these villages have diminished to the point where service calls are economically prohibitive. 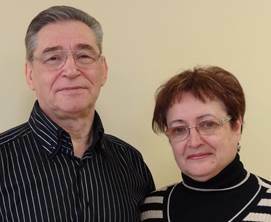 At any given time, said Yan and Tanya Sidelkovsky, who direct AAB operations in the Dnipropetrovsk region, approximately 1,000 individuals are on their client list. Some clients are rotated in and out of their service census periodically in order to serve more people, Mrs. Sidelkovsky stated. Elderly clients who die are replaced by younger pensioners; the younger pensioners may have greater needs because they do not receive the government bonuses and other government benefits (such as discounts on use of utilities) given to veterans of World War II. The program also supports some working-age Jews who are chronically ill or handicapped, as well as some Jewish families with young children in which the parents are unemployed. The core services of AAB are distribution of general food parcels to a long list of elderly and provision of food, clothing, and medicine tailored to the specific needs of particular clients, such as food and medication for diabetics. AAB also assists patients in hospitals who usually are required to bring their own linens and medicines, as well as food. Additionally, AAB provides medicines and medical supplies (such as syringes, catheters, and surgical instruments) to several hospitals, both as general assistance and as a “guarantee” of admission and competent treatment for AAB clients requiring hospitalization. A signature social program of Adopt-a-Bubbe is the warm home day centers, which are held in the apartments of participants. Adopt-a-Bubbe currently operates two warm homes in Dnipropetrovsk (one on each side of the Dnipr River) and 12 others in its broader service region. Ten to 12 seniors attend each warm home every month, with some people rotating in or out each session so that more individuals are able to participate. With financial assistance from AAB, the hostess and other participants purchase food for a full hot meal; both the hostess and some guests prepare the dishes so that the hostess is not overwhelmed and more people feel valued. Sometimes a few individuals may bring wine or other treats on their own. In addition to consuming a hot, nutritious meal, participants celebrate birthdays and holidays, sing, dance, watch videos, and take part in other activities. The opportunities for socializing and for intellectual exercise are just as important as the hot meal, said Mr. Sidelkovsky. Mr. Sidelkovsky acknowledged that the Joint Distribution Committee had initiated the warm home program and then abandoned it as a consequence of budgetary pressures, re-started it with only limited food service, then abandoned it again. The Sidelkovskys are assisted by part-time local coordinators, many of whom are recent retirees, in most of the larger Jewish population centers in which AAB is active. The coordinators receive modest compensation for their work, a supplement to their low pensions. However, said the Sidelkovskys, many of the coordinators are now 65 to 75 years old themselves and need assistance from AAB. In some cities, volunteer physicians are enlisted in AAB efforts. Consulting physicians in Boston also provide assistance. Additionally, certain medicines and medical implements are obtained in Boston and brought or shipped to Dnipropetrovsk. Inflation continues to erode the capacity of AAB to provide services, Mr. Sidelkovsky said. He estimated the rate of inflation at 30 to 40 percent, if under-the-table (bribery) costs are included. The cost of certain processed staple foods has doubled in recent years, he continued. Whereas it used to cost $25 to purchase food for 10 people at a warm home meal, Mrs. Sidelkovsky said, it now costs $50 for the same amount of food. Travel expenses also have risen, stated Mr. Sidelkovsky, making service calls to clients in remote areas more costly. AAB currently has no office; their previous office space in an unfinished basement that is part of the Golden Rose Choral Synagogue complex, was flooded during construction of the Menorah Center. AAB cannot afford to rent commercial premises, so the Sidelkovsky apartment now serves as the AAB office. Asked about the general mood (настроение) in the region, Mr. Sidelkovsky said that it is "not so joyful". It is worse than last year, he continued. No one trusts anyone in the government, and corruption is ubiquitous. He also is very troubled by the rise of the Svoboda political party in Ukraine; their rhetoric includes antisemitic expressions, he said. 39. The Beit Baruch Assisted Living Facility for elderly Jews opened in 2002, the first of only two dedicated residences for Jewish seniors in all of the post-Soviet states. Beit Baruch provides accommodations in single or double rooms with private bathrooms, meals, medical care, and social activities. The building is located in a relatively quiet outlying area on the site of a former preschool. The preschool was razed to the ground and then replaced by a clean, modern facility. Although the official capacity of Beit Baruch is 94, American geriatric specialists recommend that the total number of residents not exceed 75 to 80. The current census is only 46, said manager Mila Ruvinskaya; the low number reflects both cost concerns and a high incidence of dementia among residents; individuals with dementia usually require single rooms. The youngest patient is only 60 years old, a double amputee afflicted with severe diabetes. The oldest is 98. 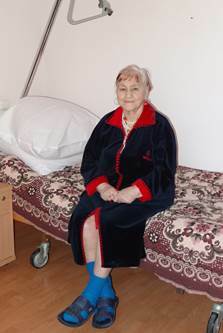 Chief nurse Viktoria Laschenko identified 21 residents as confined to their beds (лежающие), the care of whom is very expensive and very demanding. Five of these individuals are limited to food prepared in a blender. 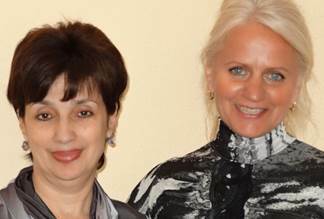 Manager Mila Ruvinskaya, left, and chief nurse Viktoria Laschenko are highly regarded within Beit Baruch and the general Jewish community for their commitment to patients and their management skills. Of the 46 residents, said Ms. Laschenko, 25 are women. Eight patients died in 2012, 26 left the facility (most to join family in Israel, but some to return to homes in Dnipropetrovsk), and 26 new people entered the facility. Several newcomers had been homeless, Ms. Ruvinskaya stated. One such individual, a former local resident, had emigrated to Israel, but returned from Israel and planned to stay with her daughter in Dnipropetrovsk; however, the daughter fell ill and could not accommodate her, so she went to a city shelter. The shelter director called Beit Baruch, said Ms. Ruvinskaya. Another newcomer had emigrated to Germany, but could not adjust to life there and came back to Dnipropetrovsk, although he was too old to obtain employment and had no home in the city. The Beit Baruch resident at far right suffers from severe diabetes and is blind from the disease. The woman in the photo at near right is a short-term resident at Beit Baruch. She is recovering from a hip fracture. Photos on this page: the writer. See also pages 84-86 for an interview with Esther Katz, who directs all Joint Distribution Committee operations in the region. The program also operates in several other regions of the former Soviet states. However, this report deals only with the actions that are directed from its Dnipropetrovsk office. In addition to assisting Jews, Adopt-A-Bubbe also reaches out to elderly Righteous Gentiles, i.e., those from families who helped Jews during the Holocaust. See pages 86-87 about the sister-city relationship between the Jewish communities of Dnipropetrovsk and Boston. Mr. Sidelkovsky is the Boston representative in Dnipropetrovsk. The other, in Kyiv, is rumored to be near closure. See pages 132-133. Boston-area physicians, led by Dr. Lewis Lifsitz of Harvard Medical School and Hebrew Senior Life of Boston, visit Dnipropetrovsk regularly. 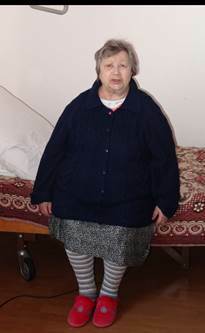 Some who returned to their homes in Dnipropetrovsk were individuals who entered Beit Baruch on short-term therapeutic stays while recovering from hip replacement surgery.